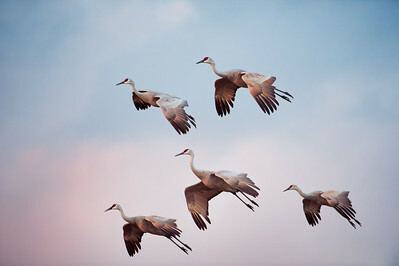 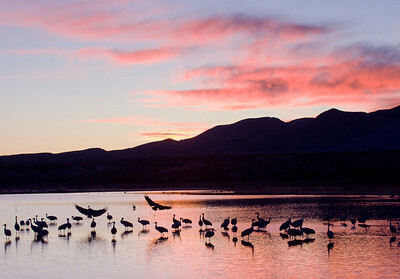 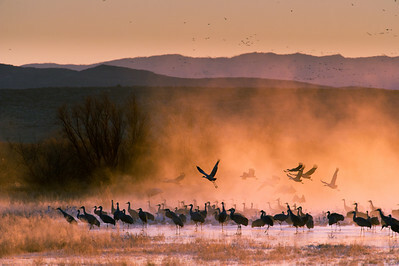 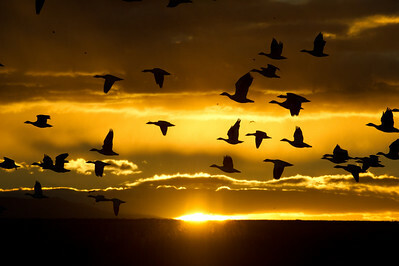 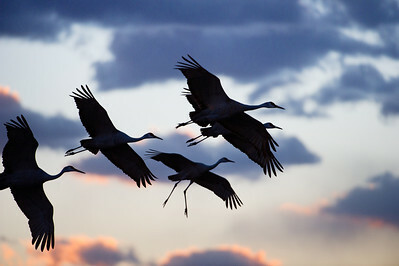 Migrating sandhill cranes at sunset in the lagoons of Bosque del Apache along the Rio Gande River flyway in New Mexico. 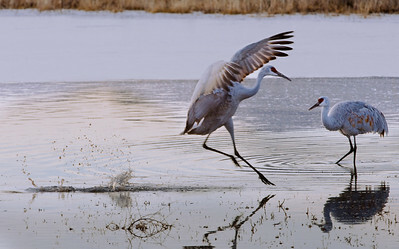 Sandhill cranes, Grus Canadensis at Bosque del Apache National Wildlife Refuge, New Mexico, in evening light, legs decended for landing. 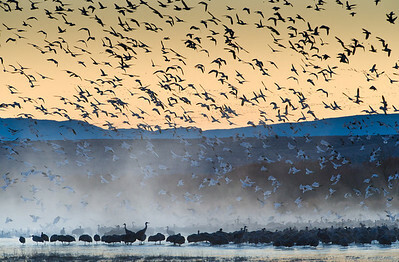 Snow geese, Chen caerulescens, at Bosque del Apache National Wildlife Refuge, New Mexico, in sunrise light. 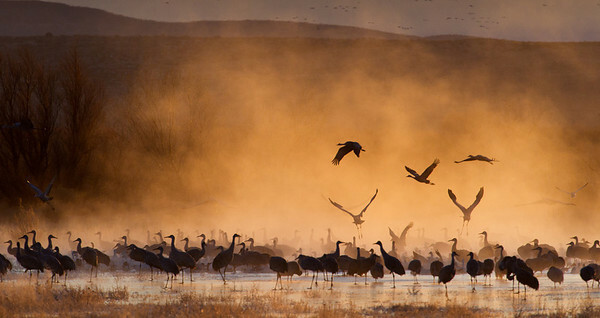 Sandhill cranes, Grus Canadensis at Bosque del Apache National Wildlife Refuge, New Mexico, in morning light. 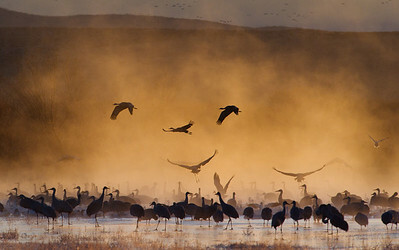 Sandhill cranes, Grus Canadensis & Snow geese, Chen caerulescens, at Bosque del Apache National Wildlife Refuge, New Mexico, in evening light. 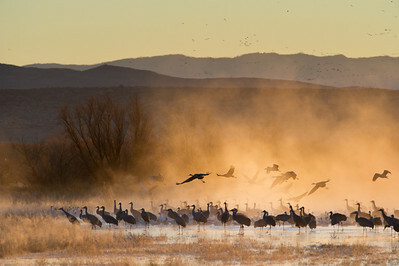 Sandhill cranes, Grus Canadensis & Snow geese, Chen caerulescens, at Bosque del Apache National Wildlife Refuge, New Mexico, in misty sunrise light. 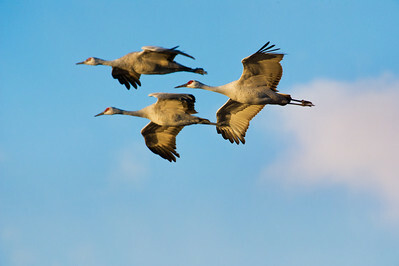 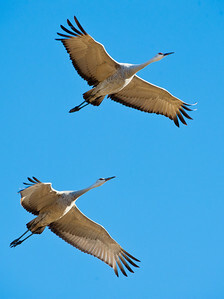 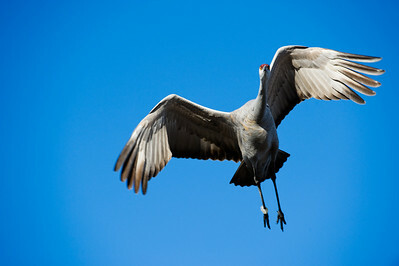 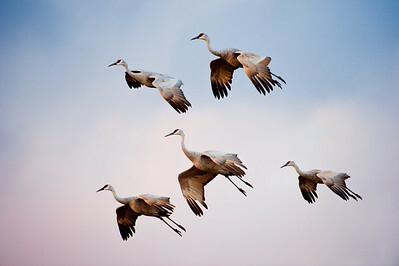 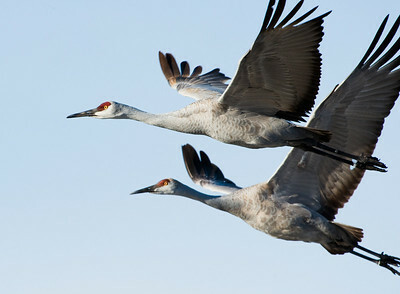 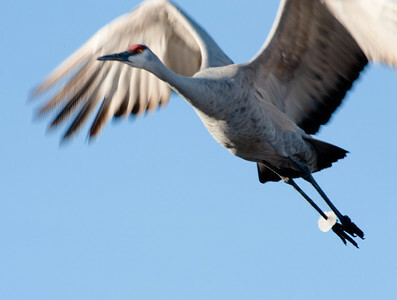 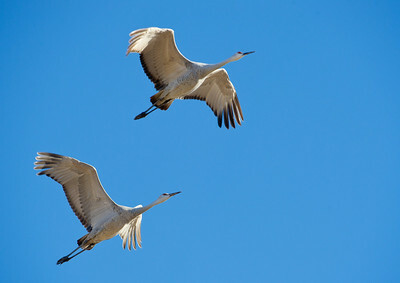 Sandhill cranes, Grus Canadensis, at Bosque del Apache National Wildlife Refuge, New Mexico. 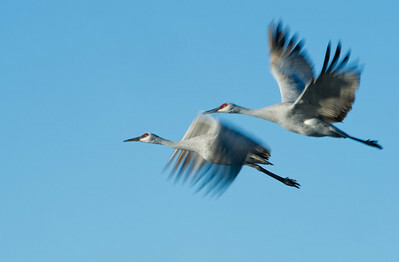 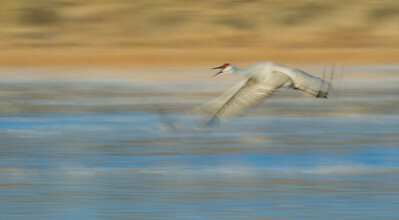 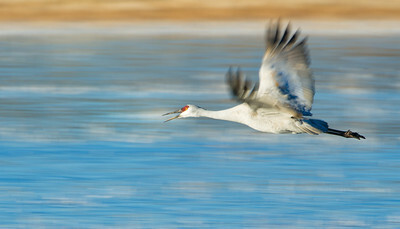 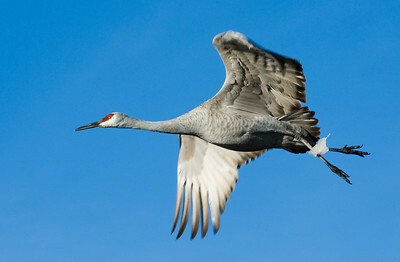 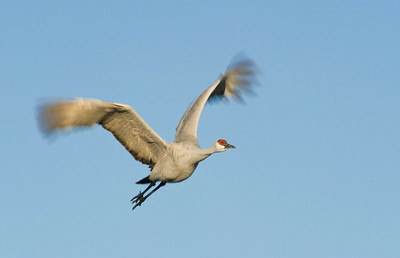 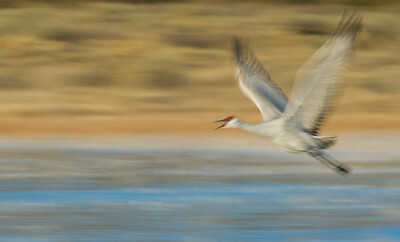 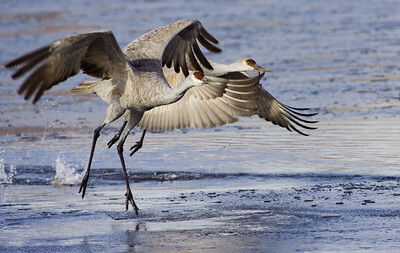 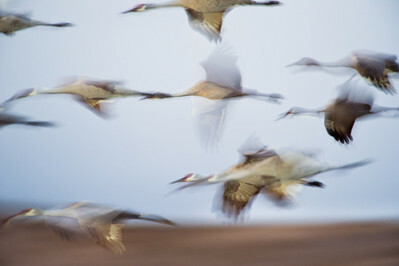 Migrating Sandhill cranes sprinting duriing takeoff over partially frozen ponds along Rio Grande Drainage, New Mexico.